The Purpose of the SOP. Exposure control measures and safety precautions. These should address both routine and accidental chemical, physical, biological, or radiological hazards associated with the procedure. Be implemented as a primary means to inform and educate laboratory personnel about hazards in their work place. All SOPs should be written by someone who has sound knowledge and experience with the material, equipment, and related procedures. The Principal Investigator (PI) or Laboratory Supervisor is ultimately responsible for the development of SOPs and should review the information to determine if it is accurate and adequate. A risk assessment is the foundation of a good SOP. Before writing an SOP, the author should think through all steps of a procedure and perform a risk assessment. A good risk assessment evaluates the hazards present during a procedure, as well as the risk associated with those hazards. A risk assessment is the process of evaluating the potential risks that may be associated with an activity. When performing a risk assessment, it is important to note the difference between a hazard and a risk. These terms are not interchangeable. A hazard is an intrinsic property of a substance or condition. It cannot be truly removed. A risk however, is the probability that a hazard will result in an adverse consequence, and the severity of that consequence. For example, a hazard associated with concentrated hydrochloric acid is skin corrosion. If one procedure calls for the use of 100-mL of concentrated hydrochloric acid, and another procedure calls for the use of 1-mL of concentrated hydrochloric acid, and both will be used in similar ways, which poses the greater risk during handling? The hazard cannot be reduced, it can only be eliminated. However, the risk associated with the hazard can be reduced. This is known as the Hierarchy of Controls and should be considered in this order. 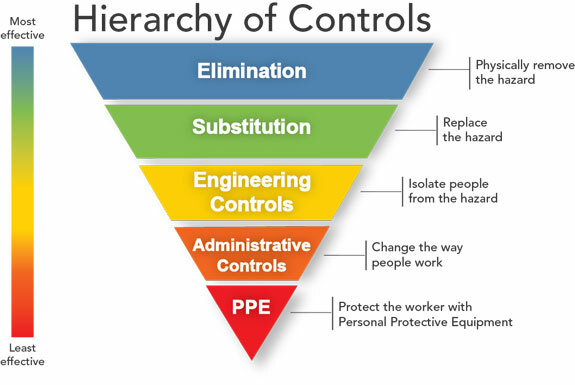 Even though PPE is listed as the least effective, it should absolutely be used. It is there in case one of the other control measures fail. Not all risk assessments need to be written. However, it is important to become familiar with all aspects of hazard and risk identification and how such information should be used as the basis for SOP development. For more detailed information about risk assessment, please see the DRS online training. Standard Operating Procedures in Research - "The Sandbox"
Standard Operating Procedures pose a unique challenge in the research environment. Research is working towards the development of reproducible results and procedures. Research is working towards the development of SOPs. Often, research labs will not have a step-by-step set of instructions to work with, and may plan on using a variety of techniques during their experiment. However, SOPs can still be used during research, if thought about from a different perspective. When preparing SOPs in a research environment, they can be viewed as a set of guidelines for working in a “sandbox”. The materials used are known, and therefore the hazards and associate risk are also known. The exact quantities and conditions between experiments may vary, but limits can be placed based on the estimated needs of the experiment, and the risks associated with them. These limits form the edges of the sandbox. Considering the parameters set by the SOP like a sandbox, you are able to define what tools you can use, and the limits at which you can use them. This will involve selecting and performing a risk assessment on a range of parameters ahead of time, such as the risks associated with approved solvents or temperature and pressure limits. Once the research expands beyond the scope (edges) of the sandbox, the SOP should be reevaluated and a new risk assessment should be performed. Expanding beyond the “box” can include scaling up a reaction beyond the limits placed initially, utilizing a new solvent other than the approved solvents, adjusting the temperature, changing the pressure, or any variety of adjustments made beyond the scope defined in the SOP. The existing SOP can be updated to reflect the change in materials or conditions, and the new risk assessment can be performed. While research often involves method development, many laboratory procedures are previously known. In these cases, there is no need to reinvent the wheel. Available resources can provide a detailed SOP with little additional effort. For example, many routine assays in biological labs are handled through the use of assay kits (such as protein or DNA extraction kits). While one should always be assessing the risk of their work, kits will include a protocol (a set of instructions and often hazard identification), and Safety Data Sheets are readily available for additional information. This information will include all of the required content of an SOP. Researchers can incorporate procedures that are known to be safe. A variety of resources can be used for this purpose, and several examples are listed below. Incorporating known procedures along with hazard awareness documents provided by DRS will prevent the need to create an SOP from scratch. In other words, there is no need to reinvent the wheel if it has been done before. Evaluating the risk is something that should happen at all stages of the experiment, from the SOP writer to the user, so it is important to evaluate the risk assessment even when a protocol is included, or when using any existing SOP. Scope/Synopsis – This is a short summary of the applicability or purpose of the SOP. Any limits to the procedure should be written here. This is used to determine if a previously written SOP can be used for a future experiment. Hazard Identification/Risk Assessment Summary – This section includes a summary of hazardous materials and conditions, in addition to engineering controls and personal protective equipment required for the procedure that have been identified through a risk assessment. Procedure/Techniques –This section describes the procedure step-by-step. It is important to provide significant detail so that lab personnel can operate under the most ideal conditions and perform the procedure safely. Disposal and Cleanup –This section should have detailed disposal guidelines (waste compatibility, quench techniques) along with proper shut down procedures for equipment or experiments. Emergency Response –This section should include any emergency response procedures that are different or in addition to from general emergency response outlined on the DRS website or in the Laboratory Safety Guide. Training Documentation – A means for documenting training on the SOP must be developed – see Training Checklist page. This can be either a paper-based or electronic method of record-keeping. A variety of resources exist that can be helpful in performing a risk assessment. Depending on the type of experiment under consideration, some may be more useful than others. Although the focus is infectious material, Section II from Biosafety in Microbiological and Biomedical Laboratories (BMBL) 5th Edition provides an excellent overview of the principles of risk assessment. The American Chemical Society provides several resources to assist with hazard identification and risk assessment. These focus primarily on chemical hazards, but the concepts can be extended to other hazards as well. The NOAA Chemical Reactivity Worksheet is a free program that can be used to find out about the chemical reactivity of common hazardous materials. This was developed by the EPA, NOAA’s Office of Response and Restoration, and the American Institute of Chemical Engineers Center for Chemical Process Safety, among others. The NIST Chemistry WebBook provides a variety of resources regarding chemical information, including thermochemical data.